The Maverick Legend Golf Trophy showcases a high lustre antique bronze coloured plastic shield mounted onto a cream marble base. The shield features two oval hoops framing the image of a golf driver and ball and is finished with silver and gold accents. This award has a high lustre bronze colour plastic plaque set on top of a marble plinth onto which you can apply the FREE engraved text plate which is supplied with this trophy. 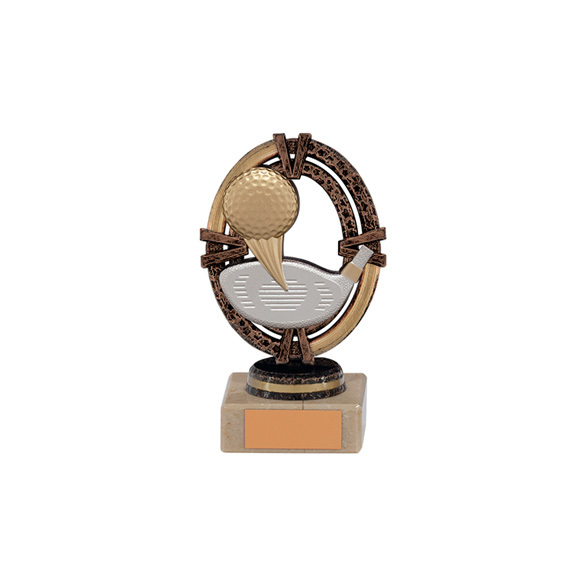 The Maverick Legend Golf Trophy features a gold golf ball and silver driver on the ornate plaque.